Following the retirement of Chefs Dan Hugelier and Kevin Gawronski at the end of the fall 2013 semester, the Culinary Arts program was in need of someone who could replace the combined 60 years of mastery that these two chefs brought to Schoolcraft. Chef Brian Beland, 34, was hired in the winter after showing his “desire to push” during a hands-on demonstration and collective interview process that involved faculty from all over campus, including the Human Resources department. 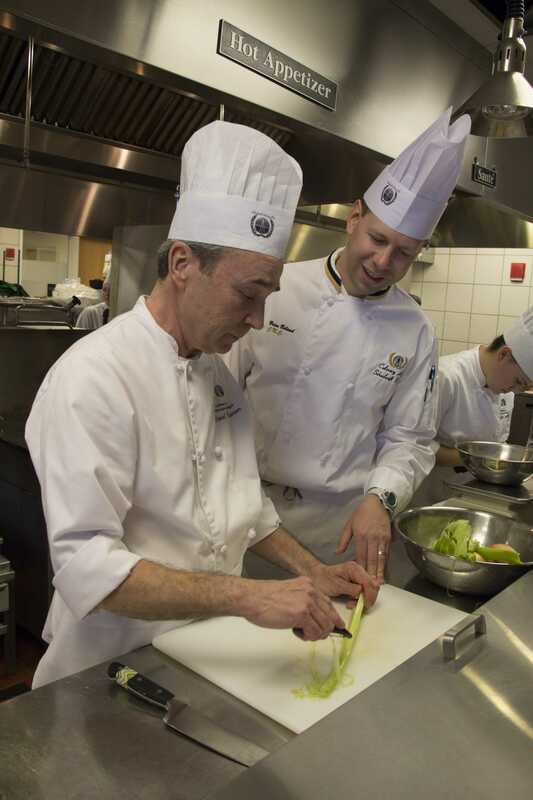 Currently, Beland is a Certified Master Chef and a full-time faculty member, teaching second-year culinary students in the 5-week International Class. The class fulfills the functions of introducing students to international cuisine, serving a banquet buffet, and preparing dinner service twice a week for the public. 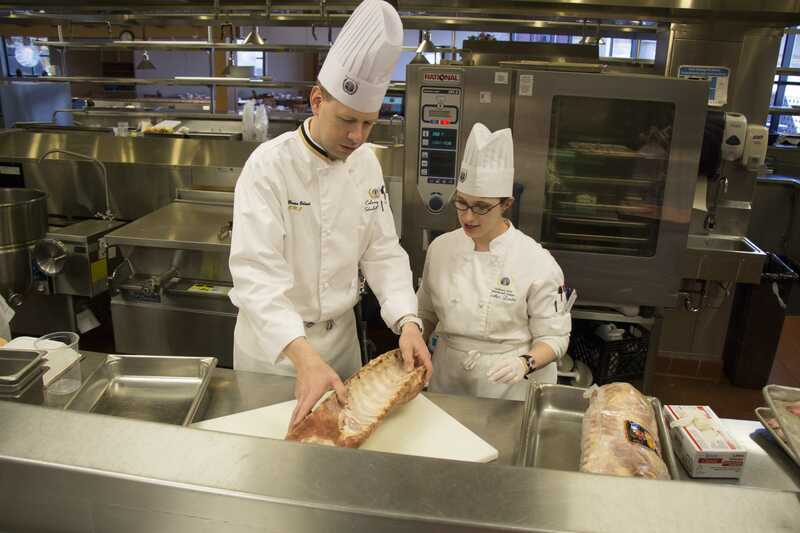 “I think it [hiring Beland] shows that the college is committed to hiring excellence,” said Chef Shawn Loving, the Department Chair for Culinary Arts, who is also a Certified Executive Chef and instructor at Schoolcraft. Typically, small teams of two or three people work together to set a dish while Beland watches and critiques. Students spend most of the class time cooking and truly preparing to work in a banquet, restaurant, buffet, or hotel. Before he was hired at Schoolcraft, Beland earned his a bachelor’s degree in Hospitality and Business from Michigan State University, performed smaller sous chef roles in local private country clubs as well as in Ohio and New York, and worked adjunct teaching roles at Oakland Community College. He is also currently serving his 10th season as Executive Chef at Country Club of Detroit. Beland is expected to contribute to the growth of the culinary program and implementation of cutting edge technology utilized at Schoolcraft. 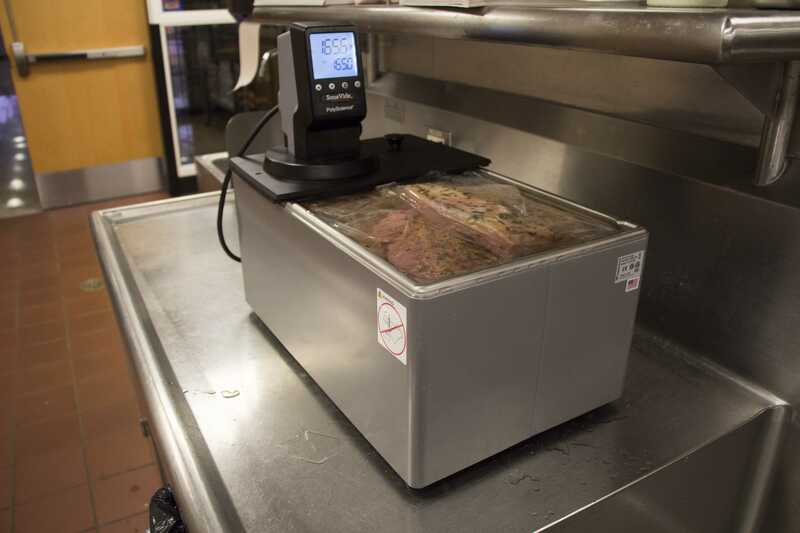 The culinary program’s newest technology is the Sous-Vide machine, which is a method of cooking food sealed tight in airtight plastic bags in a water bath at 140 degrees for eight hours, instead of the normal 350 degrees for three hours. The purpose is to evenly cook and change a food’s texture without overcooking for a juicer, better product. While the culinary program has been using this technique for years, the proper machines were placed in culinary classrooms in the fall semester, making the process more effective and contributing to the success of the students and the growth of the program. The expertise of all of the chefs, including Beland’s multiple disciplines, are vital in the evolution of the culinary program and the possibility of a 4-year culinary arts and business or hospitality college within the next few years. The 4-year program, unrelated to Schoolcraft’s partnership with the University of Toledo and Wayne State University, needs cooperation from all departments at Schoolcraft to be pulled together.